I followed V from beginning to end. And if you did follow it up to the end, you were probably not disappointed at the end of this season. It was freaking awesome. I didn't even realize it was the final episode when i started watching it... about halfway through there was so much stuff happening so fast that i figured it out. The series started out wrong from the beginning. I think the first segment was the arrival of the V's, and by the time we came back from the first commercial, they'd been there for about a month. The story just never seemed to flow right. I felt like it had the potential to be great, like they were just on the verge of getting it right, up to the end. Even at the end, with all the changes that had been made, I was hopeful that the stage had been set up for an amazing season three. But I think an even bigger problem with the show was the acting. It's hard to say how much of it was the actors, and how much was the material they were given to work with... but at least some of it was the actors, and there are at least two that I hope to never see again. In fact, there were only three characters that mattered to me. Anna... without Morena Baccarin of Firefly fame, I bet this show wouldn't have even finished the first season. And opposing her on the side of heroes was Erica, played by Elizabeth Mitchell from Lost. Maybe it was because she was surrounded by idiots and raising an idiot son, but I only ever really got behind her character when she was in the room with Anna. Anna and Erica were the two queens on the chessboard, and watching these two face off were the best character moments in the series. The third character that made the show worthwhile was Anna's daughter, Lisa.... who coincidentally is probably best known for playing Supergirl in the Smallville TV series. Lisa didn't have a whole lot to do in the first season other than keep Erica's son happy for Anna; she really shined in the second season as she tried to come to terms with fulfilling her expectations as the daughter of the queen while acting as a spy for fifth column to protect the annoying earth boy she had fallen in love with. And now that I think about it, I enjoyed watching Lisa and Erica working together.... the shared, unique goal of protecting Tyler the drooling moron was the only genuine connection I felt between any of the characters on the show. And while she didn't make or break the show for me, I have to give props for bringing in Jane Badler, best known for playing the Queen in the original V, for the role of Anna's mother, whom we discover Anna had secretly overthrown and imprisoned. I was disappointed her character was killed in the season two finale, before the character really had a chance to DO anything. For people who saw it through, the biggest complaint about the show being cancelled is that the series ended on a cliffhanger. I say, what cliffhanger? Fifth Column failed, they FINALLY killed Erica's annoying boy (to the rejoicing of V fans everywhere), and the Visitors took over earth. I, for one, welcome our new reptilian overlords. To be completely honest I didn't read your post, mainly because it said spoilers on top! I really want to watch this show sometime, just can't find the time for it. Morena Baccarin is awesome! Saw her before in Firefly and a bit in Stargate SG-1. Never got attached to V, wasnt my kind of serie. Never heard about this series, i'm gonna give it a try. I really wanna try this out now. Thanks for the review. 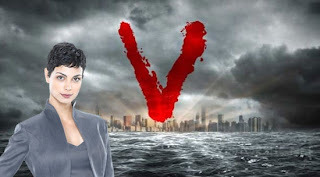 Nice dude...watching it tonight...had never heard of V.
I missed too much of V to really catch on to it, but the episodes I did watch were only because Morena Baccarin starred in it. If the comments & story pacing were as weak as you say, I think I'm better off watching another sci-fi series!